Search plays a pivotal role in just about any modern application from shopping sites to social networks to points of interest. Lucene search library is today’s de facto standard for implementing search engines. It is used by Apple, IBM, Attlassian (Jira), Wolfram, pick your favorite company . As a result, any implementation allowing for improving of Lucene’s scalability and performance is of great interest. 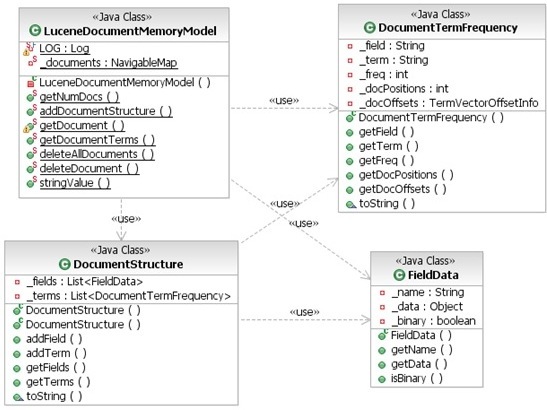 Searchable entities in Lucene are represented as documents comprised of fields and their values. Every field value is comprised of one or more searchable elements – terms. 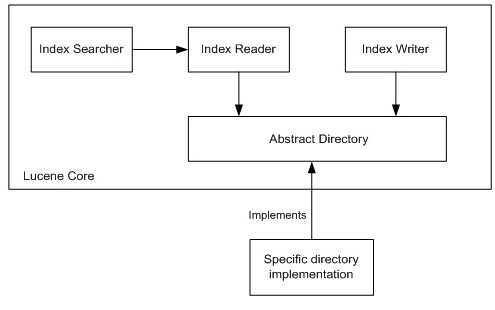 Lucene search is based on inverted index containing information about searchable documents. Unlike normal indexes, where you can look up a document to know what fields it contains, in inverted index, you look up a field’s term to know all the documents it appears in. The drawback of a standard file system – based backend (directory implementation) is a performance degradation caused by the index growth. Different techniques were used to overcome this problem including load balancing and index sharding – splitting indexes between multiple Lucene instances. Although powerful, usage of sharding complicates overall implementation architecture and requires a certain amount of an apriory knowledge about expected documents to properly partition Lucene indexes. As we have mentioned above, directly implementing directory interface is not always the simplest (most convenient) approach to port Lucene to a new backend. As a result, several Lucene ports, including a limited memory index support from Lucene contrib. module, Lucandra  and HBasene  took a different approach  and overwrote not a directory but higher level Lucene’s classes – IndexReader and IndexWriter, thus bypassing Directory APIs (Figure 2). Although such approach often requires more work , it leads to significantly more powerful implementations allowing for full utilization of back end’s native capabilities. The implementation tries to balance two conflicting requirements – performance: in memory cache can drastically improve performance by minimizing the amount of HBase reads for search and documents retrieval; and scalability: ability to run as many Lucene instances as required to support growing search clients population. The latter requires minimizing of the cache life time to synchronize content with the HBase instance (a single copy of thruth). A compromise is achieved through implementing configurable cache time to live parameter, limiting cache presence in each Lucene instance. TermDocument class contains information stored in index for a given document – document frequency and array of positions. As explained in  norms are used to represent document/field’s boost factor, thus providing for better search results ranking at the expense of using significant amount of memory. 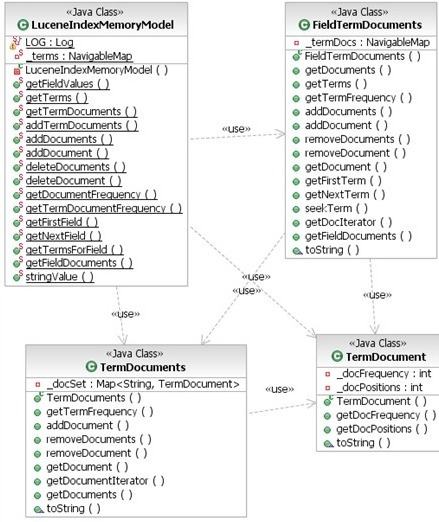 Class implementation is based on map of maps, where the inner map stores a norm for a document, while the outer one stores a norm map for a field. Although norm’s information is keyed by field name and thus can be appended to LuceneIndexMemoryModel class we decided to implement norms management as a separate class – LuceneDocumentNormMemoryModel. The reason for this is that usage of norms in Lucene is optional. With underlying memory model, described above, implementation of index writer is fairly straightforward. 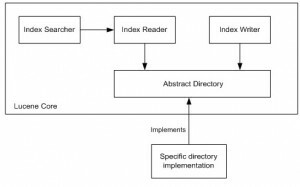 Because Lucene does not define IndexWriter interface we had to implement IndexWriter by implementing all of the methods that exist in the standard Lucene implementation. The workhorse of this class is addDocument method. This method iterates through all document’s fields. For every field, the method checks whether it should be tokenized and uses specified analyzer to do so. This method also updates all three memory structures – index, document and (optionally) norm storing information for an added document. Proposed solution is based on two main HBase tables – Index table (Figure 6) and document table (Figure 7). 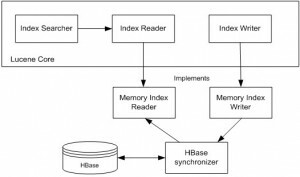 HBase index table (Figure 6) is the workhorse of the implementation. This table has an entry (row) for every field/term combination known to a Lucene instance, which contains one column family – documents family. This column family contains a column (named as a document ID) for every document containing this field/term. The content of each column is a value of TermDocument class. 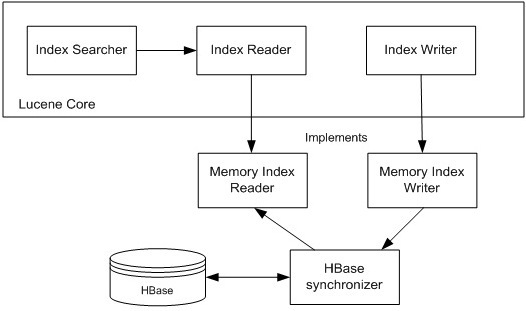 HBase document table (Figure 7) stores documents themselves, back references to the indexes/norms, referencing these documents and some additional bookkeeping information used by Lucene for documents processing. It has an entry (row) for every document known to a Lucene instance. Each document is uniquely identified by a document ID (key) and contains two column families – fields family and index family. Fields column family contains a column (named as a field name) for every document’s field stored by Lucene. The column value is comprised of the value type (string or byte array) and the value itself. Index column family contains a column (named as a field/term) for every index referencing this document. The column value include document frequency, positions and offsets for a given field/term. 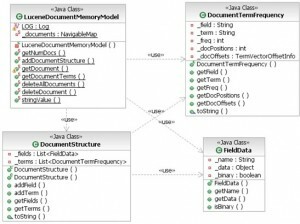 HBase norm table (Figure 8) stores document norms for every field. It has an entry (row) for every field (key) known to a Lucene instance. Each row contains a single column family – norms family. This family has a column (named as document ID) for every document for which a given field’s norm needs to be stored. Boris Lublinsky is principal architect at NAVTEQ, where he is working on defining architecture vision for large data management and processing and SOA and implementing various NAVTEQ projects. He is also an SOA editor for InfoQ and a participant of SOA RA working group in OASIS. Boris is an author and frequent speaker, his most recent book “Applied SOA”. 3. Animesh Kumar. Lucandra – an inside story! 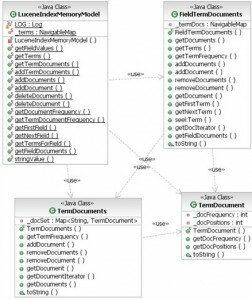 This entry was posted in Hadoop && Hive && HBase && Mahout, Linux and tagged Hbase, Lucene on 2013-04-26 by coder4.